I’m featuring in a SABC 2, 50.50. production, which the warm and passionate, full of energy, Jacqui Logie, is directing. The weather put hold to Jacqui filming me for three weeks in a row but finally the Cape winter weather smiles on us and we are on a Pisces Divers boat, heading for Pyramid Rock to dive with the beautiful Sevengill sharks. I haven’t been with sharks since the Durban trip and I’m excited. Mdu, the presenter of the show, doesn’t dive so I bid him, Jacqui and Craig, the cameraman, farewell as I backward roll, camera in hand and descend into ‘good for Cape Town’ visibility. And there they are…Sevengills must go down as yet another species of shark I absolutely adore spending time with (ok, that makes all shark species!). There’s something very special about this place, here the underwater topography makes me feel like I’m in a fantasy world. There’s a strong surge and the long kelp fronds flow in unison in one direction and then the next. Emerging like ghosts out of the milky visibility, the shadows of the sevengills weave through the kelp forests ahead of me, while beams of sunlight dance in between. This place is a true underwater wonderland! According to David Ebert, a respected shark researcher, there are a few things, apart from their seven gills, which make these great predators, who have seals on their menu, distinctly different from many other shark species. For example they only have one dorsal fin which sits far back, giving the impression they have no dorsal fin. In addition they grow rapidly in the first two years, almost doubling their birth length of about 35cm, after which their growth rate slows down. Why? Because Nature is a genius as always and a baby shark of over 70cm has fewer predators and thus a greater chance of survival, apposed to a teenie, little thing half that size. I just love the way the corners of their mouths turn up, giving the impression they are smiling. What concerns me however, is that this magnificent animal has no protection whatsoever in South Africa, and is at the mercy of demersal longline fishers, commercial handliners, and anglers. Now the thought that our beautiful sharks, which we love to dive with, and which people from all over the world are coming to see, could easily, at any time or day be killed, does not sit well with me. 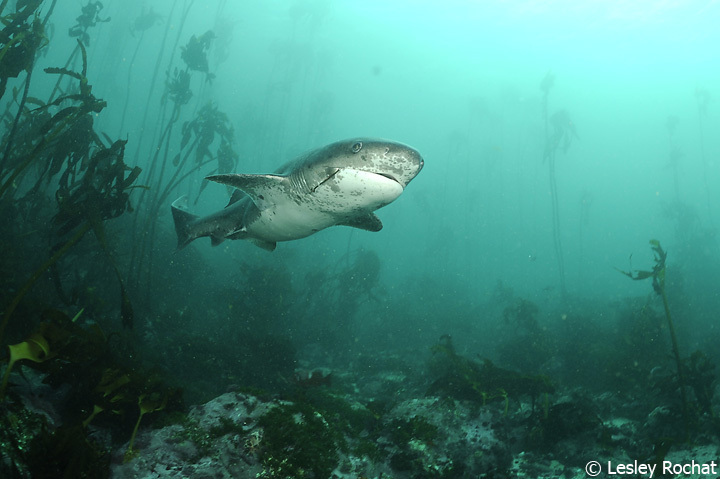 Yes, where we dive with them they are safe, but they know no boundaries and when entering and exiting False Bay they are extremely vulnerable to being caught. It is very common to see some on a dive with hooks in their mouths like the one I photographed above, the lucky ones who get away, proof of the imminent danger they face. I’m not happy that pretty much nothing is being done to protect shark species who clearly have a huge eco-tourist value attached to them, one that far outweighs the value of their flesh and fins as a once off sale. 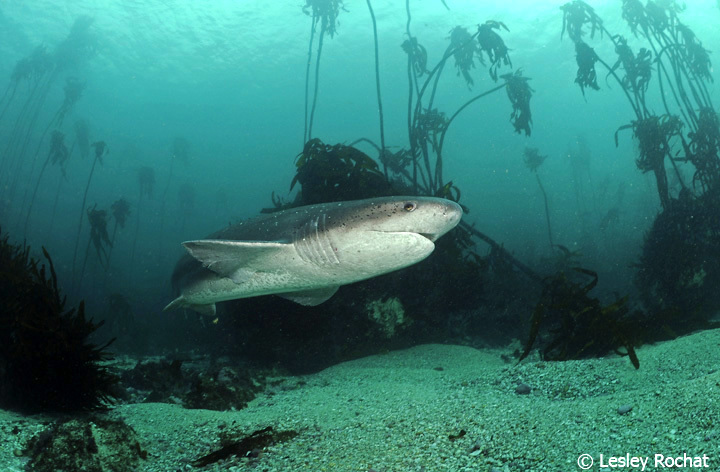 It is for this reason that the sevengill shark is a species I have included onto the list of species AfriOceans is lobbying to gain protection for (sign the petition if you have not already). 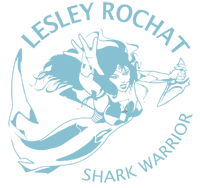 But funds and people are needed to do this work and if anyone can help raise funds, donate funds, has ideas to help us, or time to lend to this cause, then email me. I am calling on you to help build the army of support we need to help us stop the senseless slaughter of the animals we love. Imagine going to Pyramid Rock one day and it is empty of sevengills, never to return – as things stand this is a very real possibility. 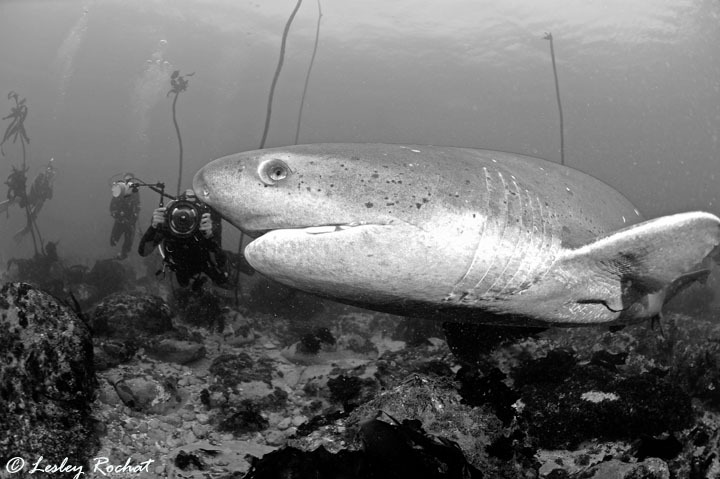 Lesley photographing a sevengill shark. Special thanks goes to Mike of Pisces Divers for hosting the 50.50 crew and me. 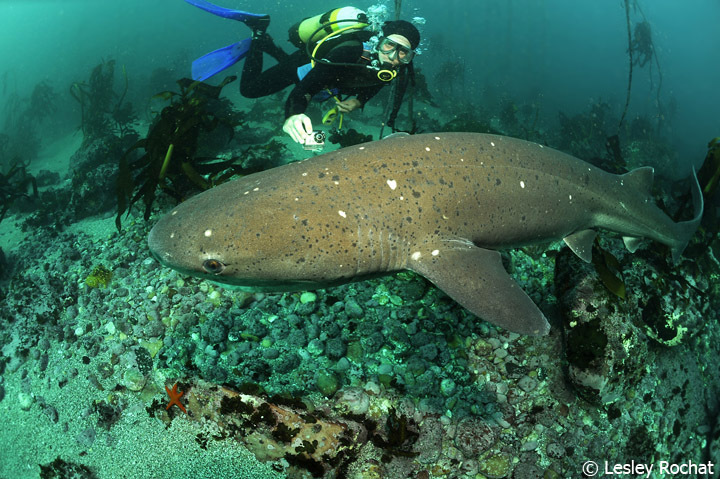 Book a dive with the sevengills, contact Pisces Divers. 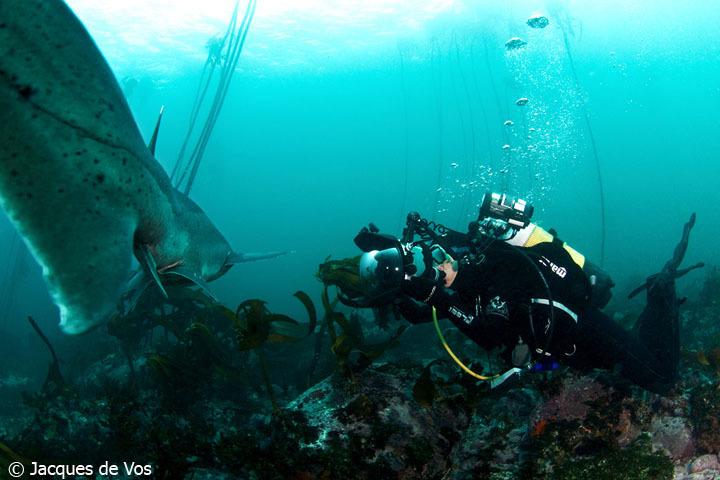 And thanks to Jacqui and her crew, as well as Jacques de Vos, a talented photographer, who took some stills of me, and Owen who shot the underwater footage. Thanks to Reef for keeping me warm and Brightweights for keeping me down! These beautiful sharks need our protection. Thank you for this excellent piece of environmental journalism and stunning images. Please help them, Shark Warrior!